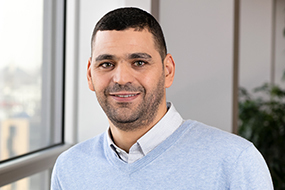 Belkacem Chikhaoui holds a Ph.D in computer science from University of Sherbrooke (Canada) and was member of the DOMUS and PROSPECTUS laboratories at the University of Sherbrooke. After his doctoral studies, he joined the Intelligent Assistive Technology and systems Lab (IATSL) at University of Toronto (Canada) as a postdoctoral research fellow. Before joining the TELUQ University, Belkacem Chikhaoui worked as data science researcher at the Computer Research Institute of Montreal. He is currently assistant professor at the Science & Technology Department of the TELUQ University and he is a researcher in the LICEF research center. He is also an adjunct professor in the Department of Computer science at the University of Sherbrooke. His research interests include data mining, machine learning, artificial intelligence, big data, social network analysis, recommender systems, and mobile computing. 2015: Best Post-doctoral poster award, Toronto Rehabilitation Institute Research Day, University of Toronto. $250. 2014: Dean’s honour list, Ph.D studies, Faculty of science, University of Sherbrooke.